The perfectly decorated Easter egg begins with the egg. Two of the most popular ways to decorate eggs begins with either a boiled egg or hollowed out egg. Getting your eggs boiled and hollowed out is a simple process and we have some tips for you below. We’re also sharing how to make homemade Easter Egg dye using natural ingredients and a few ideas to decorate your eggs! To avoid rubbery eggs do not cook eggs in boiling water. Instead, boil the water and remove the pan from the stove. Submerge the eggs in the hot, boiled water for 15-17 minutes. To hollow out an egg simply wash and dry your eggs. Then taking a thin needle, carefully poke a hole in each end of your egg. Cover the holes and shake the egg. Place your egg over a bowl or other container and gently blow into one of the holes in your egg. The egg white and yolk should make its way out of the other hole. Once the insides have been blown out wash and dry your egg again. Some eggs are easier to hollow than others. It will take patience and although more fragile, a hollowed out egg can be decorated and kept for many years to come depending upon how it is stored. Decorating your egg can be as simple or elaborate as you would like it to be. You can make beautifully designed Easter eggs with items you probably currently have in your home. Some of these ideas work egg-ceptionally well on the hollowed eggs. • Mosaic – be creative and glue pieces of tissue paper, small pasta pieces or shells to your egg. If you decide to stick to simply dyeing your Easter Eggs, here are some options to make homemade Easter Egg dye. 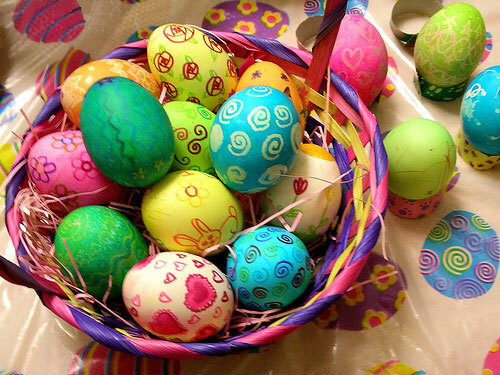 The traditional and most common way of decorating Easter Eggs is to dye them a color. You can either buy store-bought dyeing kits or make your own dyes at home using natural ingredients such as food coloring, juices, fruits and vegetables. Before dyeing eggs, fun designs and shapes can be drawn on the eggs with a crayon or piece of wax. Draw the design first then dye the egg. Combine 1/2 cup boiling water, 1 tsp. vinegar and the food color together adding drops of food coloring to achieve desired colors. Dip hard cooked eggs in dye for about 5 minutes or until desired color.